I’ve been writing Sleeping Beauties and Beasts, Book 4 of the Hands of the Highmage Series, sequel to For Whom the Bell Trolls, Of Elves and Unicorns, and Goldilock’s and the Three Dwarves. As I mentioned in my last post Sleeping Beauties and Beasts is one of the longer novels of the series so far. And, what I sent to my editor is actually the longest novel I’ve written to date. Oh, have no fear, it’s not anything approaching a George R.R. Martin length book, but it is longer than I’d originally intended. Sleeping Beauties and Beasts continues the tale told in Goldilock’s and the Three Dwarves, where twisted fairy tales have parts to play in the Prophecies need to save the world… as they did not in the lifetime of a young Princess with a magic library, a library half sister Ri’ori’s just stumbled upon–as, well, as the book that holds the tale of what happened to the mother she never knew. 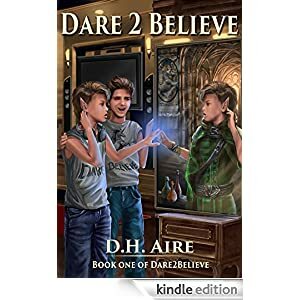 This is the tale of the Secondson, and the dragon, who if finds him will kill him, all his allies, and Ri’ori’s mother, who will sacrifice anything to save the land of her birth and the world itself from falling to Darkness. Any fans of the series interested in being advance readers, please let me know. I welcome any thoughts that might make the book even better before publication. If interested, contact me at dhr2believe at writing dot com. Sleeping Beauties and Beasts should be ready for release this spring, if my editor likes it as much as I hope, or during the summer, if necessary. It was a pleasant hour. This was the first time World Fantasy had accommodated the Indy authors like myself or the small presses, who could not afford to have a presence at the convention. The convention’s consignment area had a few tables set up outside the Dealer’s Room, which was largely one big bookstore of vendor and publishers. The fan in me bought books there, one of which I snagged so I could get an author’s autograph for the Mass Signing planned later in the day, but it was paperbacks of Elizabeth Moon’s sequel’s to Vatta’s War that seemingly found those books in my hand. I’m going to read them way too fast… I love the Vatta series! Yes, I’m a geek and definitely in the right place. That said, I went to three author readings today. First, I went to Joe Haldeman’s 10 a.m. reading, as did twenty authors. As it was the first reading of the morning, I went early. Joe arrived fifteen minutes early and talked to us about the early days of being a writer… I’d never seen Joe before, but his books were among the first few dozen I’d bought through the Science Fiction Book Club as a teenager decades ago. I also learned that Joe Haldeman taught writing at MIT for thirty years. When asked if any of his students went on to writing careers, he chuckled. “They were at MIT to become engineers, not writers. “ He acknowledged a number of them wrote very good stories for his classes, though. I then stayed to hear Lawrence Schoen do a reading— as did Joe. Now, I like Lawrence a lot and the short story he read which is being featured in a new SF magazine, Future Science Fiction Digest, edited by Alex Shvartzman coming out in December is amazing, though there was not time for him to read it all. Seeing Joe Haldeman in the first row applauding like I was at the end of Lawrence’s reading… I’m never going to forget that— whether I think of Joe Haldeman as one of Lawrence’s fans, I’ll always know he’s a true fan of the genre and appreciates his fellows in the craft. Oh, one thing about World Fantasy, there are not a lot of sessions. So, I spent time in the Hospitality Suite and talked to a few people, one of whom later bought one of my books at the consignment table during my signing. I went down to the bar to network and initially turned away. What can I say, networking in a bar feels a bit clique’ to me. A bit later I returned and said hello to another author I knew and learned there would be a gathering of some of the alumni from the writer’s workshop we’d attended after the Mass Signing.